After Amazon, Sony, and Foxit, the UK-based company Elonex International has now collaborated with the international bookseller, Borders (UK division), to launch another new eBook reader. 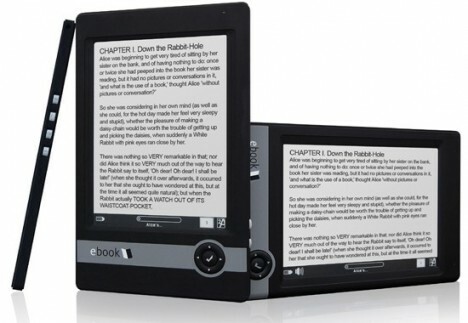 Featuring a 6-inch e-ink screen, the Elonex E-Book reader measures about 9mm thick and weighs 180g. The slim and tiny reader powered by a rechargeable battery allows users to enjoy e-reading up to 8000 pages of eBook when fully charged. The Elonex eBook reader is able to store up to 1,000 books and can be given an optional extension for additional 8000 books via a 4GB SD card. According to Elonex, the e-ink display screen is able to achieve a display that is two and a half times sharper than the conventional one and can be read in direct sunlight. Users are given 8 font sizes to choose from. They can even turn the reader horizontally/vertically for different viewing angles. As a marketing strategy, the manufacturer also pre-loads the eBook reader with 100 classics for readers’ reading pleasure. Users can also have access to the 5,000 ebooks stored in the Borders’ ebook library. The new Elonex ebook reader is compatible with Adobe Digital Editions software and supports protected reflowable PDF and ePub formats, and also other popular eBook formats and images/pictures. With the strong backup from Border and interesting built in features, surely the Elonex eBook reader will pose some challenges to competitors such as Sony or Amazon Ebook Readers. The new device is priced at £189 ($311), a fair and reasonably low price compared to others.